Never has Rio been such an object of discussion — but where is it all going? This blogger was recently asked to describe Rio de Janeiro using a spatial approach. It took two tries to succeed. Politics and socioeconomic aspects of the city were much more top of mind. But once the essay was written, it became an unexpected (and instructive) tale of two cities, with a wobbly, expanding center. It’s not easy to think spatially about Rio, a city of 1,182 square kilometers, equal to New York City (1,213 km2) and dwarfing Paris (105 km2). When considering its ongoing transformation, so many different needs and challenges come to mind: infrastructure, favela upgrades, dedicated bus lanes, the move to a full-day education program. But not what the whole city looks like, a bird’s eye view — and how this will or might change. Mayor Eduardo Paes’ second-term strategic plan, for this year through 2016, does include one city map, divided into five areas, indicating budget percentages for each one. He’s quite correctly concentrated investment in the North and West Zones, the city’s poorest. The plan, focused on a “more competitive and integrated Rio”, crafted with the help of McKinsey and Company consultants, is broken down into goals and budgeting in the categories of health, education, transportation, housing and urbanization, public order and conservation, public finance and administration, environment and sustainability, economic development, culture and social development. But there’s no overall sense of the flow of the city in the plan, its physical form — no vision. Which might be why one trips over media reports such as this one, indicating (indirectly, mind you) that ferrying workers twice daily to and from the West Zone isn’t exactly a sustainable, efficient proposition. As ridership increases, bus companies must buy more vehicles, which for most of the day sit idle. In denser, networked urban areas, transportation also tends to be denser and networked. 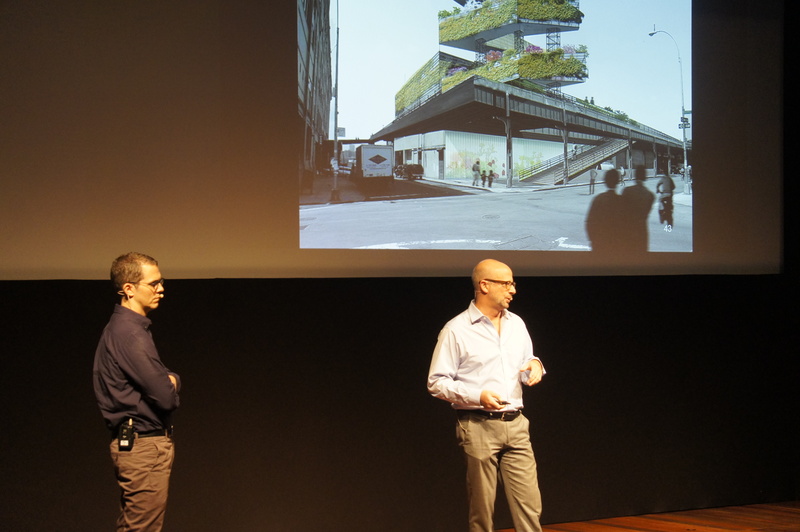 Yet as Rio’s future takes shape, in the shadow of the Olympic Games, the city has been hosting a growing number of conferences and debates, bringing together urban planners, designers and architects. Never has there been so much activity and discussion in this realm. It’s a rich exchange, with potential for real impact. Last week, Arqfuturo brought, among a fabulous roster of participants, New York’s Highline team to Rio to discuss the origins of the elevated rail line-turned-park — and how it has come to life. Their story highlighted the value of community participation, a scarce commodity in Rio. 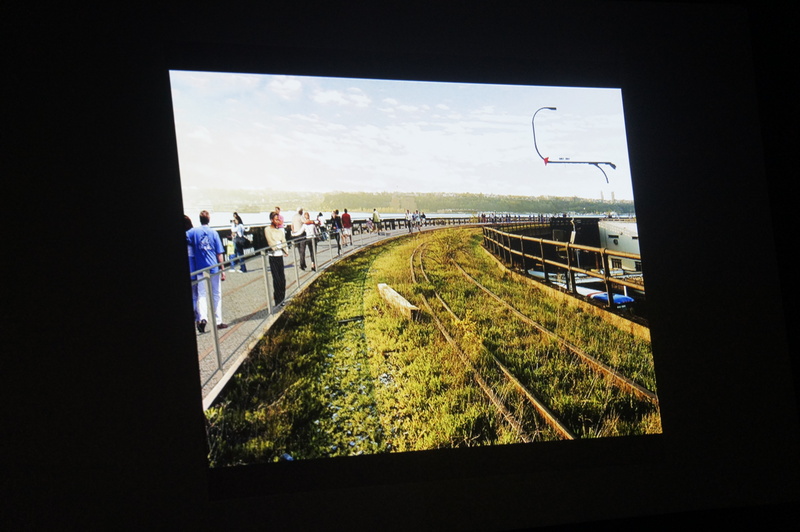 One speaker tossed off the information that housing will occupy the former railyard at the end of the last section of the line, with thirty percent reserved for low-income residents, as required by New York City zoning. “And all the units are identical,” she added. It’s hard to imagine such an environment in Rio’s developing port area, for example, where so far office space has dominated. Not far away, low-income housing is indeed going up. But the rows of Minha Casa Minha Vida (My Home My Life) federally-funded townhouses, just under the São Carlos favela, look like a Monopoly game reincarnation of what used to sit on that downtown spot: a prison. 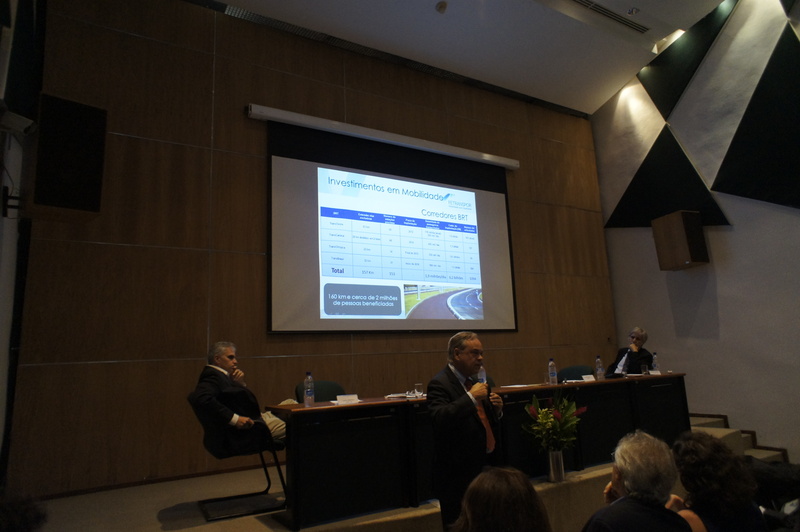 The New York-based Institute for Transportation and Development Policy held a seminar September 18 in Rio, on how the Transbrasil dedicated bus lane (BRT), to be built mostly along the existing Avenida Brasil, can benefit adjacent areas. The seminar followed on a design planning workshop which, unusually, drew together representatives from the municipal Planning, Transportion and Public Works departments, the State Transportation department and the Mayor’s office. Foreign specialists also participated in both the workshop and seminar, presumably bringing new, more sustainable ideas to Rio. You might think that local urban experts fail to keep up with current international thinking and practice. But no. Architect Helena Galiza told RioRealblog that in the early 2000s, under the aegis of the federal bank Caixa Econômica Federal and the Cities Ministry, she partnered with nothing less than the Paris city government to produce detailed plans for the revitalization of two downtown areas in Rio, focusing on housing rehabilitation. But the plans remained on paper. That’s because, she says, in 2009, partly in a job-creation response to the global economic downturn, the federal government created the Minha Casa Minha Vida program. Since then, MCMV has been building shoddy homes mostly on city outskirts, favoring big construction companies (often also big campaign contributors) and exacerbating existing transportation problems. National economic and political priorities trumped local needs and state-of-the-art urban thinking. Meanwhile, the potential for revitalizing under-utilized inner-city housing remains untapped. ” … political interests, corruption, greed, impunity, the power of the developers and construction companies, together with the historically set social unbalances never allowed democracy a fair chance to set up workable planning frameworks at the local levels, participatory systems that work and that are respected,” explains Vicente del Rio, a carioca architect and urbanist who teaches at Cal Poly, in the U.S., and was here for the ITDP workshop and seminar. 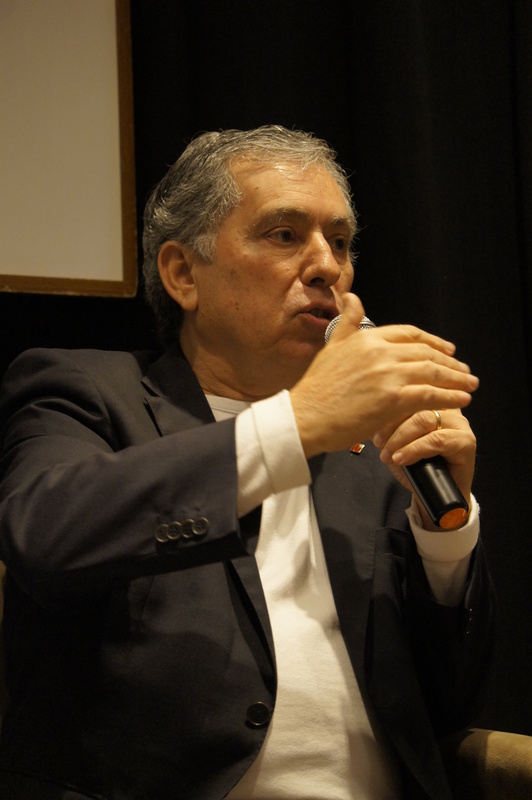 Brazilian Architects Institute president Sérgio Magalhães constantly makes the rounds in Rio, describing to all who will listen his vision of a more compact, sustainable and vibrant Rio de Janeiro. At a recent Rio de Encontros gathering at the Casa do Saber, he showed part of a striking presentation, demonstrating a longtime failure to meet mass transit passengers’ needs. Rio has worse commuting statistics than São Paulo, he said; perversely, its train and metro systems aren’t connected — and there’s no train stop at the state university, UERJ. The Powerpoint slides (particularly numbers 50-61) tell a story of urban apartheid that, if not intentional, springs at least partly from deeply-rooted attitudes of prejudice and lack of concern for Brazil’s less monied population. Lack of planning for mass transit is the key criticism of two young men who did some rethinking of Rio, authors of the blog Quero Metrô! And yes, construction companies are directly part of the transportation picture, too. The train lines, run by SuperVia (majority-owned by the privately-held Odebrecht construction company, it also manages the Complexo do Alemão cable car system), are a Rio state concession dating to 1998 and ending in 2048; the Metro Rio state concession, held by the privately-held OAS construction company and the Banco do Brasil employee pension fund, dates back to the same year and ends in 2038. Both Odebrecht and OAS are building the Metro’s West Zone extension to Barra, Line 4. While they dig away, the overall lack of vision (or is it manpower, or funding, or simple attention?) leads some planners to despair for urban planning in Rio. There was once a plan for Barra da Tijuca, created in 1969 by Lucio Costa, the architect and urban planner who, together with Oscar Niemeyer, drafted Brasília. Though, as this April 2013 Globo article explains, the Barra plan was much distorted over time, the region is still automobile dependent and competes with downtown Rio (there’s even a mall confusingly named Downtown) — as Costa first imagined. Mayor Paes, who grew up in Barra da Tijuca, argues that now that the region has been populated, the city must serve it — ergo the new Transoeste dedicated bus lane, and the Metro extension. But there are nuances in all of this that demand attention. Until now, Rio has grown and changed rather haphazardly, without an overarching vision, except for the early twentieth century Pereira Passos era, when central Rio was reorganized with Paris in mind. Mayor Paes aims to make his mark on the city equally, and his government never sleeps, its hand in every possible aspect of citizens’ lives. The streets are full of trucks and traffic coordinators, municipal guards, trash disposal guides, and an increasing number of buses. 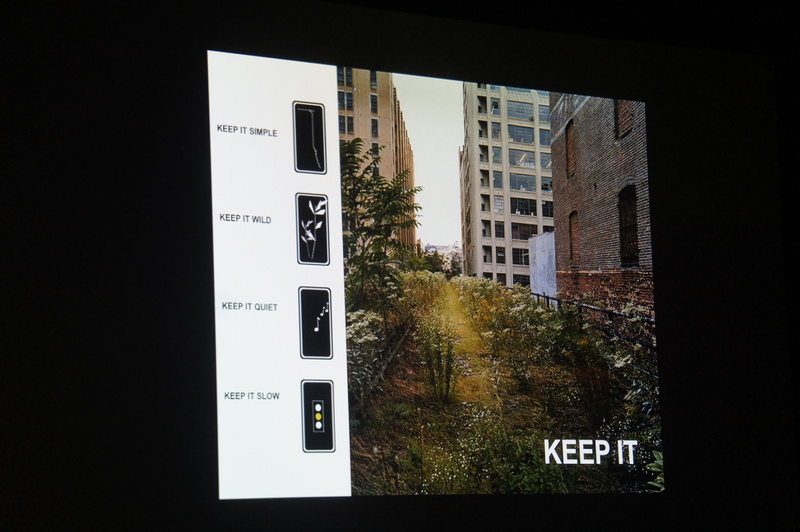 How will we and our descendants live in the city we’re creating today? How accessible will the whole of it be to all of us, for work and leisure, to live in a healthy area? Will West Zone residents zip in to Lapa, to dance samba? Will South Zone residents travel to the Cidade das Artes, in Barra, to hear the Orquestra Sinfônica Brasileira? Or will we be exhausted from our commutes, and find that moving around, beyond the essentials, is too much trouble, too costly? Will anyone but North Zone residents visit the splendid Madureira Park? Never have there been more people, Brazilian and otherwise, focusing on Rio de Janeiro. Never has there been a better moment to think of it as an integral and living organism — and to plan for the future of those who will live in it. This entry was posted in Brazil, Transformation of Rio de Janeiro / Transformação do Rio de Janeiro and tagged Arqfuturo, Barra da Tijuca Lucio Costa, Barra da Tijuca metrô, Barra da Tijuca plan, Clarisse Linke, Ephim Shluger, IAB, ITDP Rio de Janeiro, Rio de Encontros, Rio de Janeiro downtown, Rio de Janeiro housing, Rio de Janeiro port revitalization, Rio de Janeiro transportation, Rio de Janeiro urban planning, Sérgio Magalhães, Vicente del Rio. Bookmark the permalink. Once again, informative and enlightening, with some cause for cautious optimism. Thanks! Rio’s main problem is the lack of investiment in public transport. It never happened in this city and in my opinion it’ll never happen. I’m a bit pessimistic about the future in this city. The state government has no interest in doing this. For example he expanded the metro lines to Leblon and Ipanema as if its residents were poor and needed them, whereas in the carioca suburbs there aren’t metro lines.